Domain Name System (DNS) is an Internet Engineering Task Force (IETF) standard name service which enables applications and users to connect to hosts in TCP/IP based networks by specifying a name. DNS makes it possible to assign domain names to organizations independent of the routing of the numerical IP address. DNS is a hierarchically distributed database that creates hierarchical names that can be resolved to IP addresses. The IP addresses are then resolved to MAC addresses. DNS therefore provides the means for naming IP hosts, and for locating IP hosts when they are queried for by name. The method for updating address information in a DNS database. The method for querying address information in a DNS database. The schema of the DNS database. The ability of replicating address information between DNS servers in the DNS topology. The HOSTS files were used to resolve host names to IP addresses before DNS was in existence. The HOSTS files were manually maintained by administrators. The HOSTS file was located on a centrally administered server on the Internet. Each site or location that needed to resolve host names to IP addresses had to at regular intervals download a new copy of the HOSTS file. The size of the HOSTS file grew as the Internet grew. The traffic that was generated from downloading a new copy of the HOSTS file also grew. This led to the design and implementation of Domain Name Service (DNS) in 1984, the hierarchically distributed database that can resolve host names to IP addresses. The main design requirement of DNS provides the following key features over the HOST file. The database has an unlimited size. Together with supporting host name to IP address mappings, different data types are supported as well. No degrade in performance as more servers are added . the database is scalable. Distribution of administration . naming can be managed individually for each partition. There are a number of ways to find out whether a system is resolving properly, nslookup can be used to verify name resolution. The nslookup command can be used to find various details relating to a particular DNS (Domain Name System) such as IP address, MX records, etc. Go to the command prompt and type in nslookup host_name server_IP_address. Replace the actual host name to be resolved for host_name and the IP address of the DNS server for server_IP_address then press enter. This allows the user to verify if an error is on the server, if there is a widespread resolution error, or if the server is possibly down. Nslookup will also display the various types of DNS records, not just primary (A) records, or all records for a domain. Users can then ping with the switch to also verify if DNS resolution is working fine. Resource records (RRs) were not dynamically updated in a zone. An error was made when manually adding or modifying static resource records in the zone. Stale resource records in the DNS server database left from cached lookups or zone records not updated with current information or removed when they were no longer needed. The recursive query times out before it can be completed. DNS server recursion has been disabled. Also troubleshoot the connectivity to the root servers. Verify that the DNS server used in a failed query can ping its root servers by IP address. If a ping attempt to one root server fails, it might indicate that an IP address for that root server has changed. A NetBIOS name cannot be greater than 16 characters. With DNS, up to 255 characters can be used for names. The NetBIOS naming system is a flat naming system. The namespace used by DNS is a hierarchical space, or hierarchical system. The DNS naming system is called the domain namespace. If you decide to use a private domain namespace, and there is no interaction with the Internet, it does not have to be unique. The naming system used by DNS is a hierarchical namespace, called the DNS namespace. The DNS namespace has a unique root. The root can contain numerous subdomains. Each subdomain also can contain multiple subdomains. The DNS namespace uses a logical tree structure wherein an entity is subordinate to the entity which resides over it. Each node in the DNS domain tree has a name, which is called a label. The label can be up to 63 characters. Nodes that are located on the same branch within the DNS domain tree must have different names. Nodes that reside on separate branches in the DNS hierarchy can have the same name. Each node in the DNS domain tree or DNS hierarchy is identified by a FQDN. This is a DNS domain name that specifies the node.s location in relation to the DNS domain tree/hierarchy. A domain name can be defined as the list of labels along the path from the root of the DNS domain tree/hierarchy to a particular node. The FQDN is the entire list of labels for a specific node. Each domain registered in DNS is connected to a DNS name server. The DNS server of a domain provides authoritative replies to queries for that particular domain. Organizational domains can be used globally. They are named via a three-character code. The code defines the main function of the organizations of the DNS domain. Geographical domains are usually used by organizations not residing in the United States. They are named via a two-character country and region codes. The codes were established by the International Organization for Standardization (ISO) 3166. Reverse domains: These domains are used for IP address to name mappings. This is called reverse lookups. .pro; for credentialed professions such as attorneys. A DNS server is authoritative for the contiguous portion of the DNS namespace over which it resides. Provide redundancy: It is recommended to install one primary DNS server, and one secondary DNS server for each DNS zone (minimum requirement). Install the DNS servers on different subnets so that if one DNS server fails, the other DNS server can continue to resolve queries. clients from transversing slow links for name resolution requests. Zone files store resource records for the zones over which a DNS server has authority. DNS server, DNS resolvers are used. resolution queries for the portion of the DNS namespace for which it is authoritative. Returns an authoritative answer for a particular domain. Recursive queries: The DNS server has to reply with the requested information, or with an error. The DNS server cannot provide a referral to a different DNS server. Inverse queries: The query sent to the DNS server is to resolve the host name associated with a known IP address. All the domains have to be queried to provide a correct answer to the query. 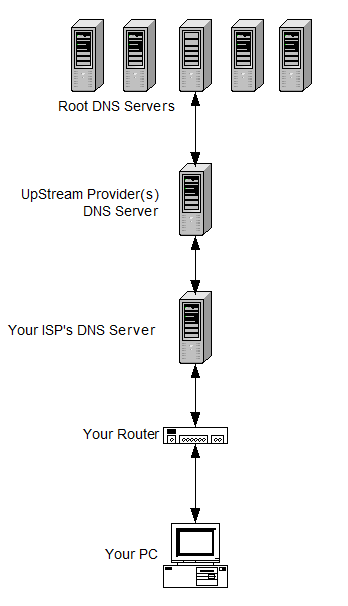 process whereby which the DNS server queries other DNS servers for the client. By the initial DNS server querying the other DNS servers, recursion actually ends up making the initial DNS server a DNS client! In order to perform recursion, root hints assist the DNS server in determining where in the DNS namespace it should commence searching for the queried name. Root hints is a collection of resource records which the DNS Server service utilizes to locate DNS servers who are authoritative for the root of the DNS domain namespace structure. If however recursion is disabled for the DNS server, and the DNS server cannot find a match for the queried name in its zone information, or in its cache; the client begins to perform iterative queries. The root hint referrals from the DNS server are used for iterative queries. When a client performs iterative queries, the client sends repeated requests to different DNS servers to resolve the queried name. In DNS, caching is used to reduce traffic on the network that is generated from queries sent to DNS servers. The DNS Server service and the DNS Client service both utilize caching to improve DNS performance, and reduce DNS specific traffic. DNS Server Cache: When the DNS server performs recursive queries for clients, the DNS server stores the resource records in its DNS server cache. If the same information is requested again, the cached information is used. The contents of the DNS server cache is removed when the DNS Server service is stopped. You can also manually remove the contents of the DNS server cache by using the DNS console, the management console for administering DNS. The DNS Client service starts: The records in the HOSTS file are loaded into the DNS client cache. The DNS server responds to a client.s request: When the DNS server returns a response to a query, the information is added to the DNS client cache. The contents of the DNS client cache is removed when the DNS Client service is stopped. Good heavens. That’s like saying “RPM’s per minute” when the “PM” already means “per minute”. Expanding DNS you get “computer running the Domain Name Server Server service” !! BIND, by the way, stands for “Berkeley Internet Name Daemon”. 464 queries in 0.450 seconds.